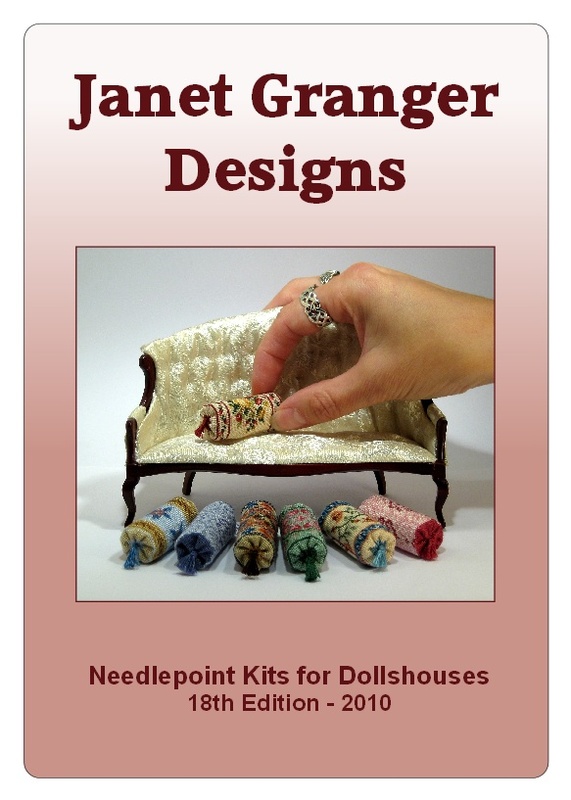 My new doll’s house needlepoint catalogue is here! 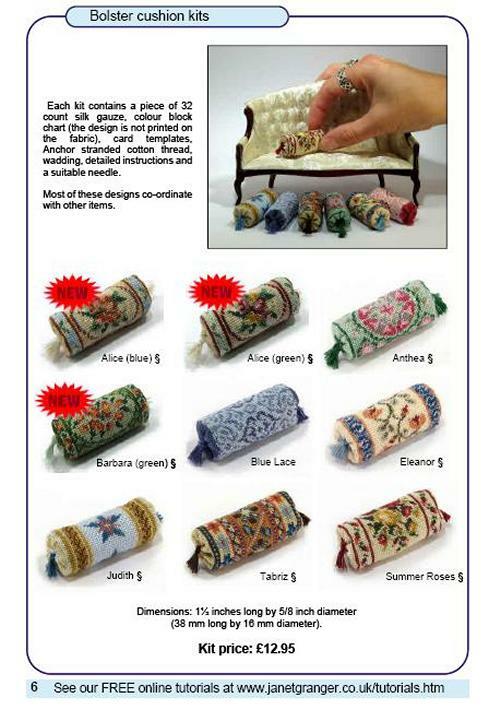 I’ve just uploaded the 2012 catalogue showing all of the miniature needlepoint kits and charts that I sell on my website – almost 200 of them, now! 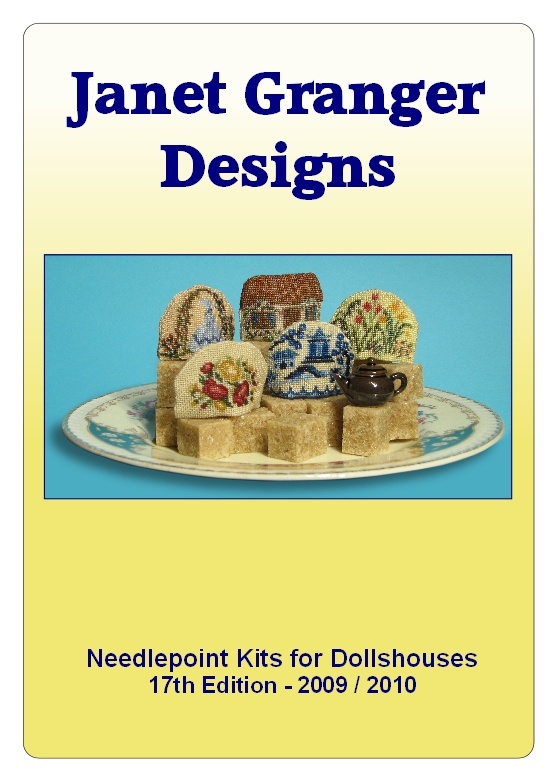 The catalogue is now 28 pages, and shows all the designs in the range, so you can browse it for ideas for things to make for your twelfth scale doll’s house or room setting. Even if you don’t have a doll’s house, a group of these miniature stitched items look good together, maybe under a glass dome, or as a collection on a bookcase or narrow shelf. Many of the designs come in matching sets, which can be bought individually, so that if you like the ‘co-ordinated look’ in your own home, you can now have the look in miniature, too. The kits contain everything you need, from the canvas or silk gauze, and suitable threads and needle, to the unique components, such as a tiny metal bellpull end, or a kit to make a mahogany tea tray. There’s a section on my website here that shows you what you get in each kit. The charts are printed with colour blocks, rather than black and white symbols, so it is really easy to count the design off the chart as you stitch it onto the fabric. Full instructions are given in each kit on how to assemble the item when it’s finished. If you’d like more information before you buy, then have a look at the Tutorials section of my website, where extra help is given on all the types of kit that I sell, as well as help for beginners on how to do needlepoint stitches, and so on. The catalogue can be downloaded for free as a pdf, or you can send off for a paper version (£2.50 worldwide, including postage). 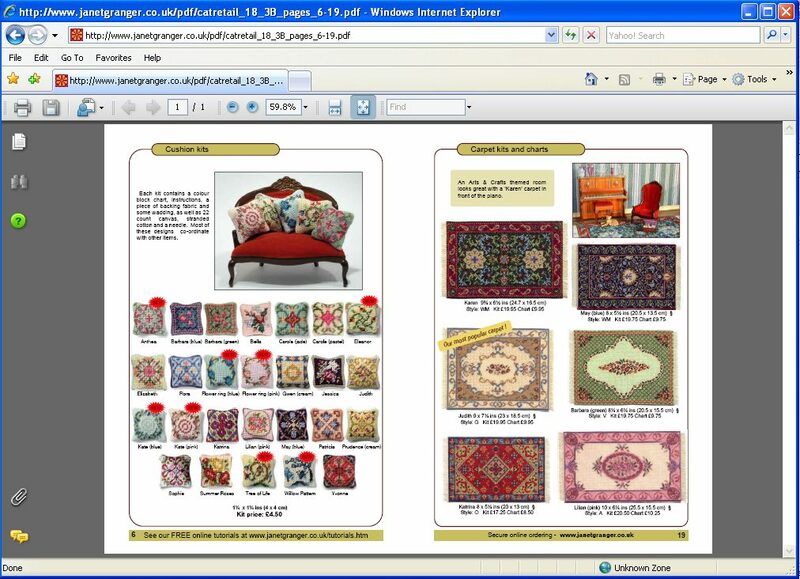 Author Janet GrangerPosted on May 3, 2012 Categories Catalogue as free downloadTags Crafts, Doll's house, Doll's house embroidery, Doll's house furniture, Dollhouse, Embroidery, Hand embroidery, Miniature needlepoint, Needlepoint1 Comment on My new doll’s house needlepoint catalogue is here! 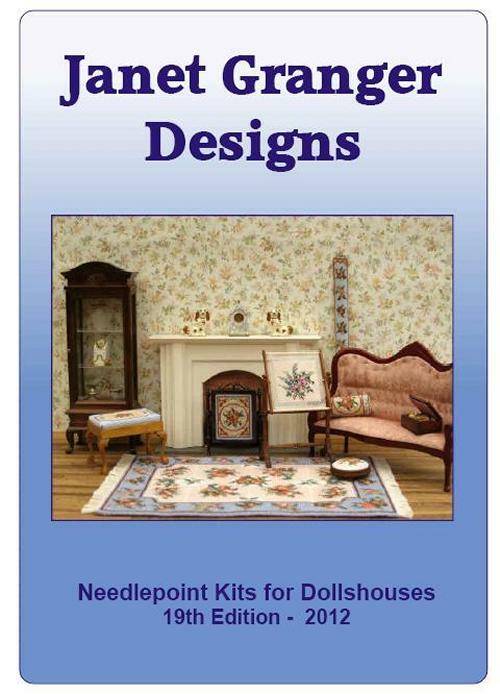 Our new doll’s house embroidery catalogue is now available as a FREE download!! We’ve been working lately on getting a new edition of our catalogue of doll’s house needlepoint kits ready – the previous one was suffering a bit from ‘supplement-itis’! It’s been expanded to 24 A5 pages, and features all 170+ kits and charts in our range, plus accessories such as tiny teapots to fit under the teacosies, and project-sized pieces of small count canvas (18 and 22 count) and silk gauze (from 32 right up to eye-watering 112 count). There’s information on how to do the needlepoint stitches, as well as full details about what each type of kit contains. So, it’s now ready and available to download for free from here. If you prefer us to print one and post it to you, that’s still possible – you can order one online for £1.25 plus shipping (post free if your order total comes to more than £10). But if you’re like me, once you see something you want (especially catalogues), you want it NOW. Author Janet GrangerPosted on October 21, 2010 March 5, 2012 Categories Catalogue as free downloadTags Catalogue, Craft catalogue, Crafts, Doll's house, Doll's house embroidery, Doll's house furniture, Dollhouse, Embroidery, Free download, Hand embroidery, Miniature needlepointLeave a comment on Our new doll’s house embroidery catalogue is now available as a FREE download!! 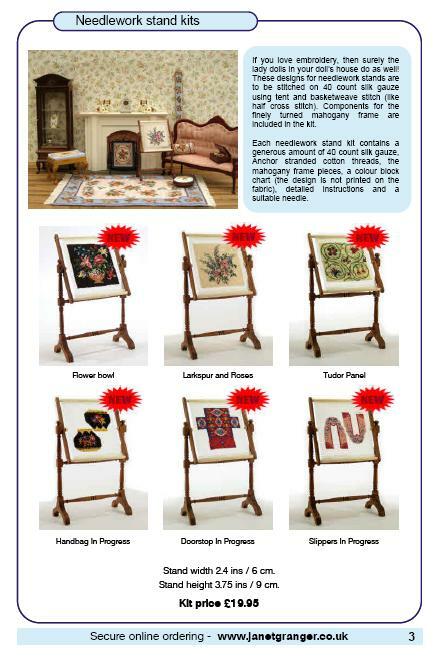 There has been a paper catalogue available for the miniature embroidery kits that I design, that can be ordered online and posted out, for over ten years now. But I know that, when you want a thing, you want it NOW!! So, I’ve eventually got round to making the catalogue available in .pdf format, downloadable to your computer instantly, from this page on my website, so that you don’t have to wait for postal delivery (and, even better, the .pdf version is FREE). It features all the doll’s house scale embroidery kits and charts (over 200), in full colour. 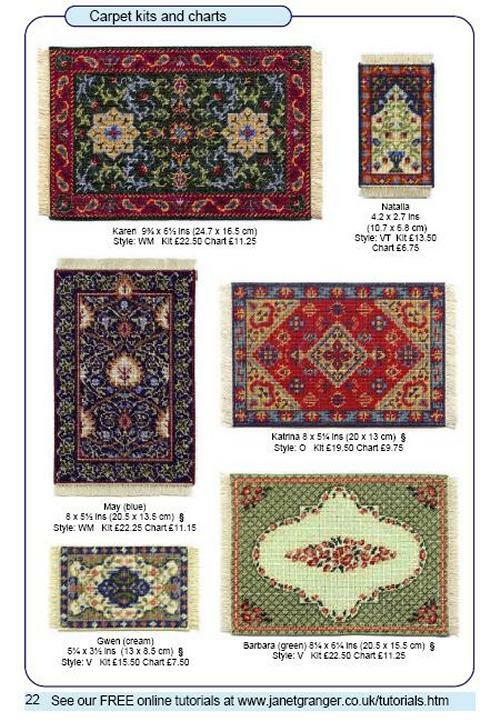 At the moment, a supplement is also available, showing the very latest additions to the range, along with a price list. You can then print out the pages if you choose to, to browse through later when you’re not at your computer. Of course, you can still order the paper version if you prefer to do that. 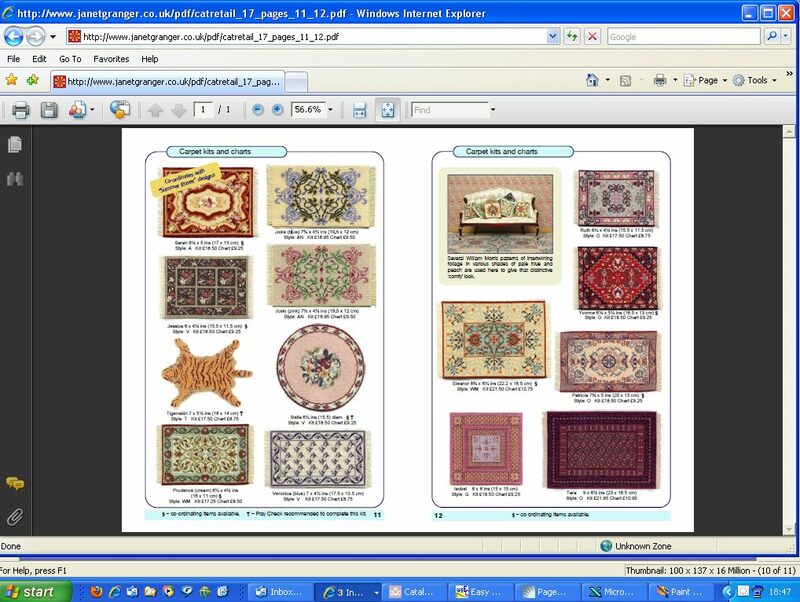 Soon, there will be the facility to download needlepoint charts direct to your computer, too, so watch this space!